S I G N & D I G I T A L G R A P H I C S • March 2018 • 81 large format and label printer manu- facturer Durst Image Technology U.S. in Rochester, New York. 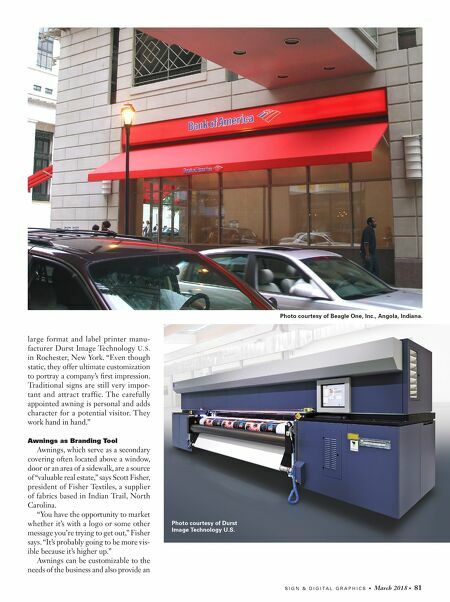 "Even though static, they offer ultimate customization to portray a company's first impression. Traditional signs are still very impor- tant and attract traffic. The carefully appointed awning is personal and adds character for a potential visitor. They work hand in hand." 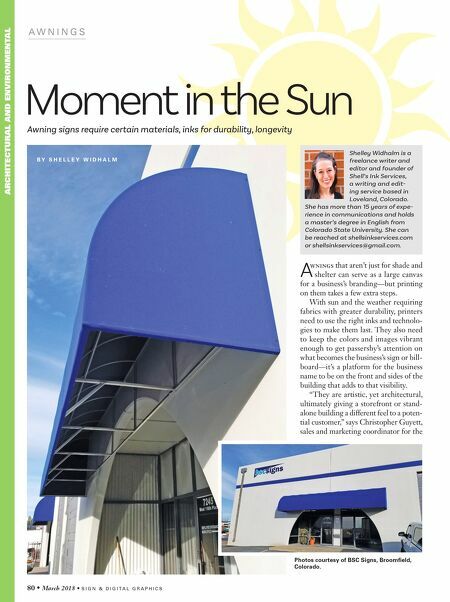 Awnings as Branding Tool Awnings, which serve as a secondary covering often located above a window, door or an area of a sidewalk, are a source of "valuable real estate," says Scott Fisher, president of Fisher Textiles, a supplier of fabrics based in Indian Trail, North Carolina. "You have the opportunity to market whether it's with a logo or some other message you're trying to get out," Fisher says. "It's probably going to be more vis- ible because it's higher up." Awnings can be customizable to the needs of the business and also provide an Photo courtesy of Beagle One, Inc., Angola, Indiana. Photo courtesy of Durst Image Technology U.S.